Suzuki has released an updated version of its GSX-R600 supersport contender, now boasting an all-new white and black livery. All-New Suzuki GSX-R600 is Here! The hotly anticipated, all-new 2011 GSX-R600 supersport machine has arrived in Australia, after wowing the industry and enthusiasts in preview displays. A proven race winner around the world, Suzuki's GSX-R600 supersport machine has arrived in Australia with three brand new colours available for 2009. 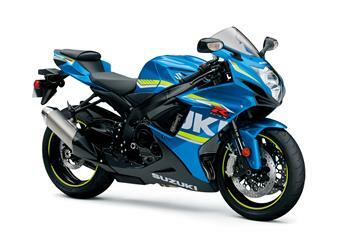 All-New Suzuki GSX-R600 Now Here! The hotly-anticipated, all-new 2008 Suzuki GSX-R600 supersport machine is now available in Australia, after wowing crowds across the country in sneak preview displays. Suzuki Australia is set to unveil a show-stopper at this weekend's Sydney Motorcycle Expo with a sneak preview of the hotly-anticipated all-new 2008-model GSX-R600K8. 2007 GSX-R600 & GSX-R750 Are Here Now! Suzuki's 2007 GSX-R600 and GSX-R750 models have arrived in Australia. Suzuki Australia's first-ever GSX-R-only Ride Day held at the Phillip Island Grand Prix Circuit last Friday has been declared a massive success, prompting plans for additional Suzuki ride events. In association with Eastern Creek Ride Days, Suzuki Australia has announced its first Sydney 'GSX-R Only' event to be held at Eastern Creek International Raceway on Monday 11 December 2006. In association with Phillip Island Ride Days, Suzuki Australia has announced their first 'GSX-R Only' event to be held at the world-renowned Phillip Island Grand Prix Circuit on Friday 29 September 2006. Suzuki Australia and Mat Mladin Imports are giving away over $17,000\* worth of prizes, including a brand new Suzuki GSX-R600. New Suzuki GSX-R600 Is Here! Suzuki's all-new 2006-model GSX-R600 has arrived in Australia! In the continuing evolution of the illustrious GSX-R performance series, Suzuki Australia has revealed advance details of its much-anticipated 2006-model GSX-R600K6. 2018 Suzuki GSX-R600, including a new eye-catching new Metallic Mystic Silver / Pearl Glacier White colour scheme.